Game Masters can be nit-picky sticklers with wands up their butts. It’s a respectable mode for navigating the endless charts and dice rolls and idiosyncratic mechanics of tabletop RPGs. Seriously, I respect you, stickler GMs. Without you, I wouldn’t know the difficulty class for reaching across the table and grabbing a Cheeto. Is that a Dexterity check? Ah, come on man, just fudge it! Whatever! 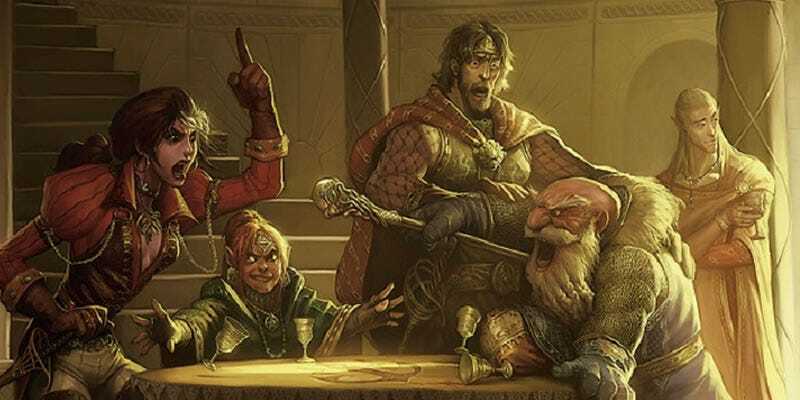 As any good Dungeon Master knows, sometimes you’ve got to wing these fussy scenarios to keep the story moving. A player wants to spin plates on a dire rhino’s horns while it’s moving at approximately 15 feet per second Northeast? While the moon is a waxing gibbous, can the necromancer delight in the blood of ambidextrous dark elves resistant to tree sap if her Charisma modifier is below 3? Chill. Seriously. Let’s just say it’s a Constitution check with a DC of 12, for all of it. Eikre added that there was a strong possibility that those gulps of Red Guitar weren’t the first of the night.